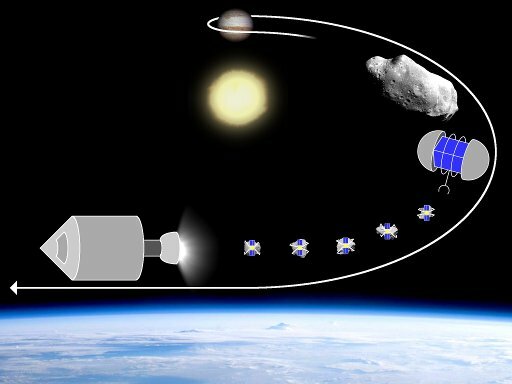 Concept: Lithobeam Launch is a medium-heavy lift system boosted by kinetic impactor drones in solar retrograde orbit. The bulk of impactor drone mass is raw regolith gathered from a retrograde NEA. A 2 ton mining probe investment returns a 100 ton payload capability to LEO. Impact: Lithobeam offers radical reductions in launch costs with a combination of high acceleration, high specific impulse, low cost, and low mass. The system uses a 2 ton mining probe to harvest 10 tons of rocks, which are then used to boost 100 tons of payload to LEO in up to 10 launch missions (either one heavy launch of 100 tons, or ten medium launches of 10 tons each, or any combination in between). With an impact velocity around 65km/s, specific impulse is over 10,000s. Each ton of drones can boost a 13 ton client spacecraft to LEO or a 9 ton client spacecraft to C3. Unlike other CATS concepts, Lithobeam offers a large payload capacity for a small initial investment--up to a 130 ton superheavy spacecraft for a 2 ton of initial investment. In contrast, space tethers, space guns, and beam launch only offer small payload capacities for large initial investments. To amortize costs, those CATS concepts need large numbers of small payload launches, but actual mission demand is for small numbers of large payload launches. Lithobeam offers cheap access to space in a way that matches actual demand. Study Proposal: The proposed study will analyze the theoretical performance of the main thruster, based on simulations of the 60+km/s collisions of the drones and sprayed water propellant. The primary focus will be to optimize propellant to drone mass ratio and propellant spray geometry to guarantee vaporization and maximize performance. The future development path requires analysis of the drone's spark gap guidance thrusters, experimental validation of the hypervelocity plasma collision dynamics, optimization of the nozzle design, development of a suitable pneumatic/electromagnetic piston, and development of ground based multi-lateration navigation beams. The drone guidance modules require significant development, as each module should be less than 200 grams in mass. 1) Launch 2 ton mining probe toward Jupiter with C3 of 46km2/s2. 2) Free gravity assist at Jupiter places probe into retrograde orbit. 3) Probe performs deep space thrusts to match orbits with retrograde NEA 2009 HC82. 4) Probe lands on the asteroid, harvesting decimeter scale rocks. 5) A guidance module is attached to each rock, converting it into an impactor drone. Each guidance module consists of a solar powered control chip, wire grasping fingers, and spark gap pulsed plasma stationkeeping thrusters. These thrusters use the rock itself as propellant. 6) After ~1000 impactor drones are prepared, they adjust their orbit toward Earth. They home in on a virtual corridor in space defined by GPS style navigation coordinates. 7) The 13-130 ton Lithobeam client spacecraft is lofted into a suborbital trajectory with SRBs or a reusable suborbital LRB. 8 ) The Lithobeam client spacecraft homes in on the virtual corridor, and points its pusher nozzle sideways to accept the incoming impactors. 9) The spacecraft sprays water propellant, which is vaporized by the drones arriving at 4 per second. Each impact causes an explosion of plasma which is deflected rearward by the pusher nozzle. The pusher is mounted on a central piston to smooth out acceleration. 10) The spacecraft achieves orbital velocity after ~250s of 3+ gee acceleration. Here's a picture of the 2009 HC82's orbit. From the diagram, it looks like it's on the way out for now. Q1: How long does it take for the drones, once launched to arrive at Earth? Q2: How long is the launch window on Earth for the payload that has to rendezvous with the drone train? Q3: How often do these launch windows open up? Q4: This is going to require hyperprecise guidance; what kind of IMU's are you going to use? Q5: How much do the guidance modules mass, or are you going to manufacture them in situ? Q6: How much water does the payload have to bring and how fast does it have to flow? Q7: How do you know the impactor won't simply pass through the water vapor and destroy the payload? Q8: If you could actually get the robotic manufacturer to work as you hope, that would make a great anti-satellite weapon that could take out the Earth's entire satellite population in a single, surprise blast, couldn't it?